Weaponry Fanatic | How Many Pieces of Weaponry do You Own? How Many Pieces of Weaponry do You Own? Enthusiasm for guns is more controversial than it ever has been. This is due to higher than ever rates of gun violence in North America. Gun bans have been discussed at great lengths but currently the right for citizens to bare arms is still in place. The fascination with guns is also at an all time high, with personal collectors investing higher and higher amounts into their gun collections, partly due to gun ownership rights being in question. The desire to collect guns is harmless when the collector is a responsible gun owner, and a great many people are. Handguns are the most widely collected type of gun in North America. Handguns are used in indoor shooting practice and ranges, as well as in outdoor spaces where firearms are permitted. 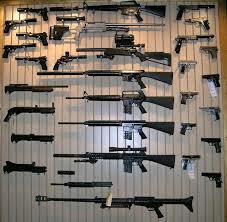 They are the most recreational of guns and are used for a variety of outdoor purposes. Rifles and shotguns are used more for defense and hunting purposes. The controversy over gun ownership arises due to increased gun violence in jurisdictions that permit private gun ownership. Many people currently feel that gun permit application processes are not careful enough in their screening. Subsequently, dangerous weapons are ending up in the hands of mentally ill and malicious people. This is a valid concern as it puts the public at risk of violent crimes. It raises the question of who should have access to guns, and what kind of guns. Having a passion for guns and building a collection to be used safely is fine, however, having an obsession with guns that makes a person overly focused on them is not. People have a variety of hobbies and collections. Some people collect stamps, some people collect antique spoons and some people collect sharp things. Particularly men, but often times women as well, will take an interest in switchblades, knives, swords and other sharp weaponry. People come into a fascination for sharp weapons through a variety of ways. Perhaps they were raised to be outdoor savvy, or perhaps they felt the need to be able to defend themselves in some situations. Regardless, building a collection of sharp weapons can become a lifelong vocation and passion. Switchblades and knives are very similar. They are both handheld and multipurpose. A switchblade is a type of knife that is not legal everywhere because of how popular it is among perpetrators of violent crimes. Switchblades are mechanisms that conceal the knife blade until a trigger releases it and it springs out. They are popular among perpetrators of violent crimes because they can go undetected and fit in small compartments on a person. Knives may have retractable blades or non-retractable blades and range in size but can always be held with one hand. Swords are often a separate collection, but enthusiasts of sharp weapons frequently have them among their collection. Swords are also handheld but the blade is much longer than that of a knife and is not retractable. Swords are most commonly known for their historical use in war and in ancient civilizations. They are collector’s pieces when they are brand new for their craftsmanship and when they are old for their history. Real sharp weaponry enthusiasts may spend money, join tournaments, subscribe to magazines and belong to organizations with fellow enthusiasts. Many people who are passionate about sharp weaponry spend their lives devoted to collecting pieces, becoming educated in sharp weaponry and participating in activities that allow them to use their sharp weapons. As long as it does not become an unhealthy obsession, it can be very rewarding. Weaponry Fascination Normal or Unhealthy? Some people, men and women alike, take a very strong liking to various forms of weaponry. The weaponry may range from machetes to torture devices to ancient weapons to machine guns, but knives and guns tend to be the focus of many weapon enthusiast’s fascinations, typically because they are the most accessible. It is not uncommon for a person to become so interested in these forms of weaponry that they begin their own collection, subscribe to relevant magazines and have hobbies that include using their weapons recreationally, either for hunting or some other sport. But what happens when interest turns into weaponry obsession? Is the hobby still harmless? When a person transitions from taking a harmless interest in weaponry to obsessing over it, things can turn sketchy. First of all, to be obsessed with or addicted to anything in life is to be mentally unhealthy. The key to good mental health is balance and balance cannot be achieved in the midst of addiction. A person who obsesses over their weaponry collection to the extent of only wanting to spend their time talking about it or playing with it is likely doing so at the cost of their personal relationships, life obligations and reputation. It is one thing to have a hobby but it is quite another to have a treatable addiction. Some people take their fanatacism to another level. They begin to guard their personal weaponry collection and become paranoid about all the ways they may have to use it. Many weapons collectors are also conspiracy theorists and believers in imminent apocalyptic events. It can be dangerous for people of this mindset to possess as many weapons as they do. It is not uncommon for this type of person to resort to use of their weapons in any stressful situation, regardless of whether it is appropriate or not. There is nothing wrong with being an avid collector of weapons, but it is a hobby that requires levelheadedness and scope. Are You Addicted to Weaponry? Weaponry holds a particular fascination for certain people, particularly men. Where as an addiction to shoes is found more commonly among women, an addiction to different types of weaponry is more commonly found among men, and is likely associated with testosterone. A fascination with weaponry usually begins forming at an early age and is frequently passed down from parents or other close family members. 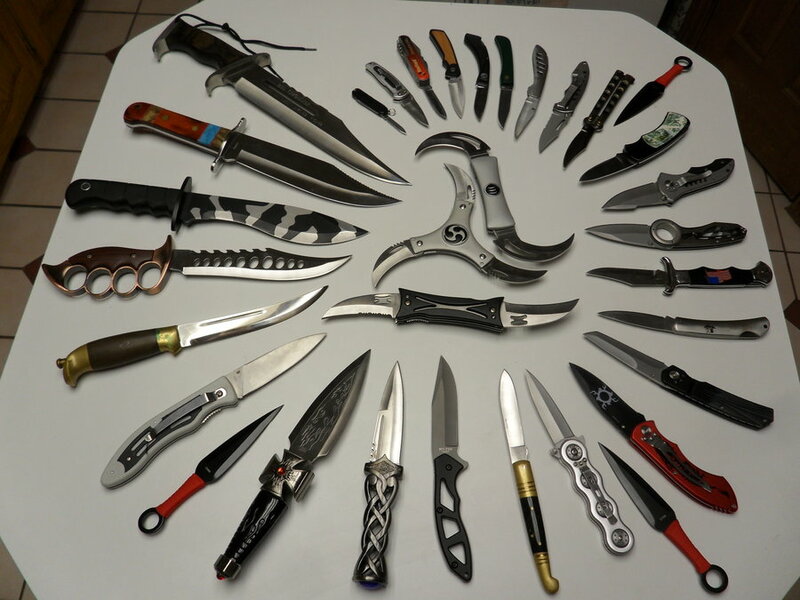 When someone is addicted to weaponry, they usually have large collections of guns, knives, swords, crossbows and other instruments of defense. Taking an interest in these items is fine, but when interest becomes obsession, problems can arise. Guns have been a topic of much heated debate recently in North America. There is no weapon available to the public that does more damage than a gun. Whether it is a rifle, shotgun, handgun or other variety of gun, it is by far the most lethal weapon a person can legally possess. Many people are fighting to change this, of course, but for the owners of large gun collections, a right to bare arms is something willing to fight for. Those who are legitimately addicted to guns, who invest excessive amounts of time, energy and money on guns, are particularly adamant about their right to bare arms. People can become equally addicted to their collection of knives, swords and other sharp weapons. These addictions also demonstrate a level of devotion to weapons that goes far beyond what is normal or healthy. When those who live with the addict complain about the pervasiveness of the collection, when the addict is unable to manage their finances due to excessive weaponry purchases or when responsibilities in the addict’s personal life are neglected due to focus on weaponry, it may be time to seek intervention. If you or someone you care about is overly involved with their weaponry collection to the point of dysfunction, reach out for the help of a professional addiction counselor or interventionist. Any type of addiction, no matter how obscure, can be destructive to the addict’s life.